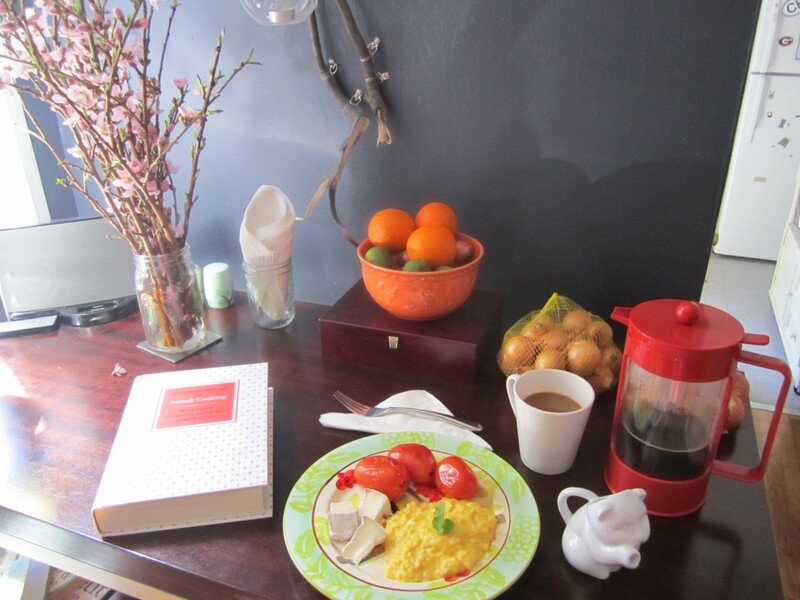 Un Petit Déjeuner Pour Une « I'd rather be in France. 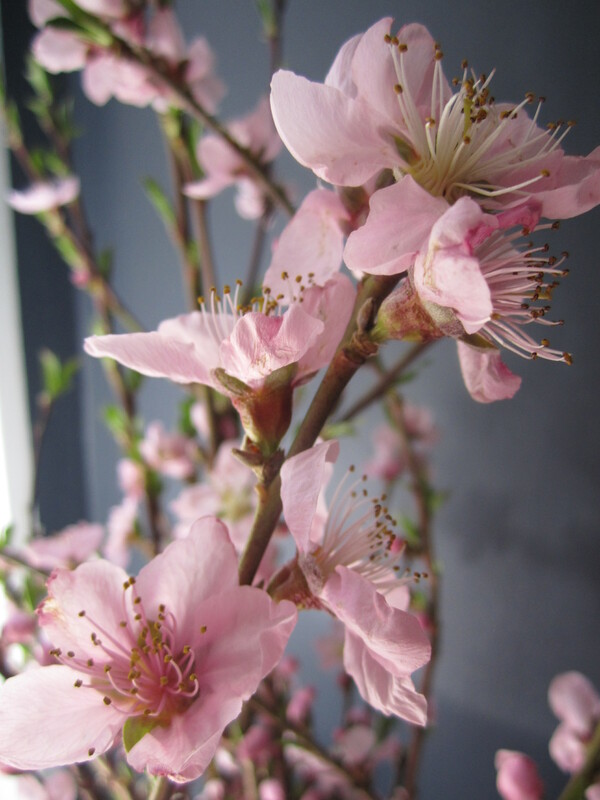 After a wonderful, busy day yesterday, I am postponing changing out of my pajamas as long as possible — even though the glow of springtime sunshine is beckoning me outdoors. 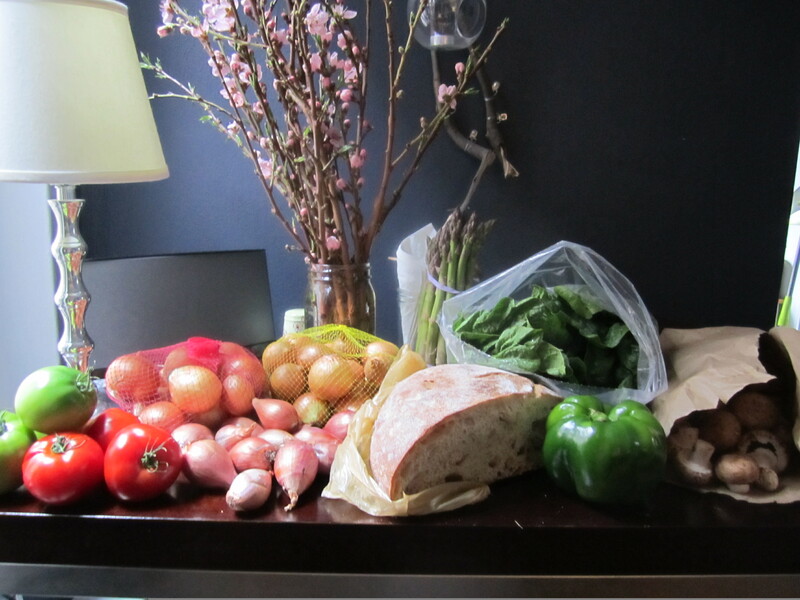 Yesterday began with a stroll down to the Union Square Greenmarket where I laid down 40 bucks and came home with a pretty good haul. I was ecstatic to discover pearl onions for $2 a bag. Mushrooms were considerably cheaper as well, and I had the added benefit of being able to ask the mushroom man how to store my mushrooms (paper bag in the fridge). I’m not a big bread eater, and I have no idea what I am going to do with my half loaf, but the bread stand was so pretty I felt compelled to buy something from them too. 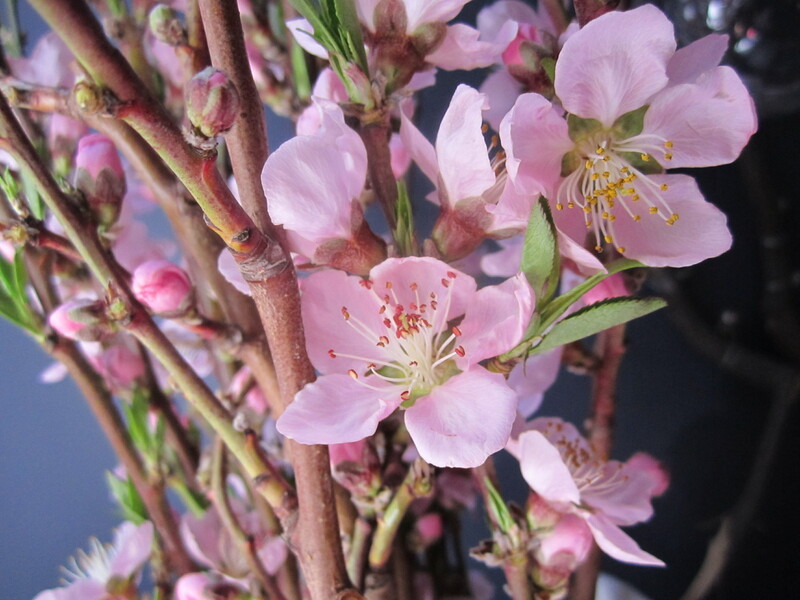 The flowers are peach blossoms, by the way, and were the splurge of the day at $10 for a bundle. I think they are worth it, don’t you? After the market, I headed down the street to a spa for a facial appointment and (somewhat) regretfully turned all diva on a young, inexperienced esthetician. The peak was when I stood up and pointed at her and then at the door and said something like, “This is a complete waste of my time.” I was angrily putting my clothes back on when the manager came in and somehow convinced me to stay and did the facial herself. Sure, it may sound dramatic, but you have to have confidence in someone who is going to hold sharp objects near your face and has access to a slew of skin dissolving chemicals. That ordeal took three hours, so I wasn’t able to cook something French and fabulous for a backyard barbecue up in the Upper East Side (next time, Arthur, I promise! ), but I brought an offering of beer and limes in exchange for delicious, homemade guacamole, burgers, and lemon cake. Then it was time to christen the rooftop of the Empire Hotel (and my summer party wardrobe). I think this blog is catching on faster than I realized because the same photographer at Empire showed up at the Dream Hotel shortly after we did. Coincidence? Perhaps. All that is to say I am taking it easy today. I poked around the kitchen this morning looking for something respectable to eat that would involve minimal dish washing and ended up flipping through Mastering the Art of French Cooking. 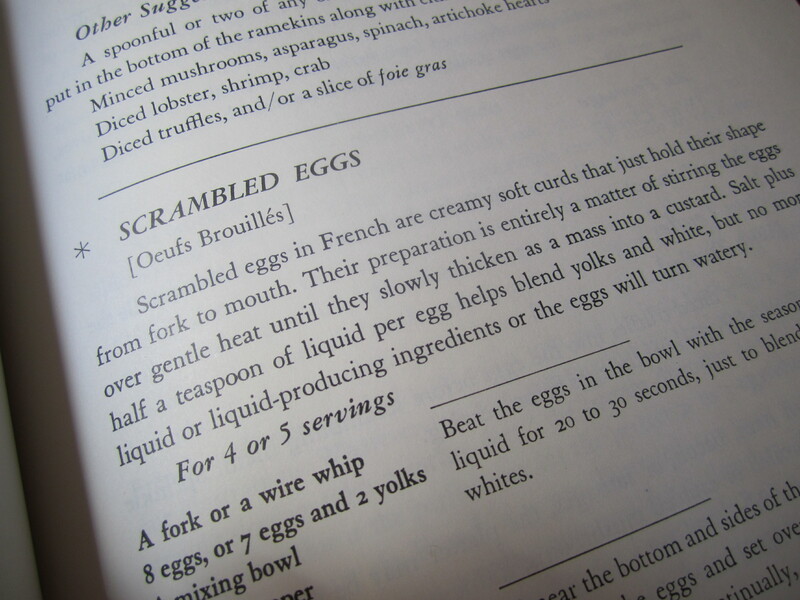 Julia Child has a whole chapter on eggs, which I have been avoiding because Julia makes cooking eggs look incredibly complicated. I contemplated trying my hand at an omelette, but that is going to require some outdoor flipping practice involving dried beans. 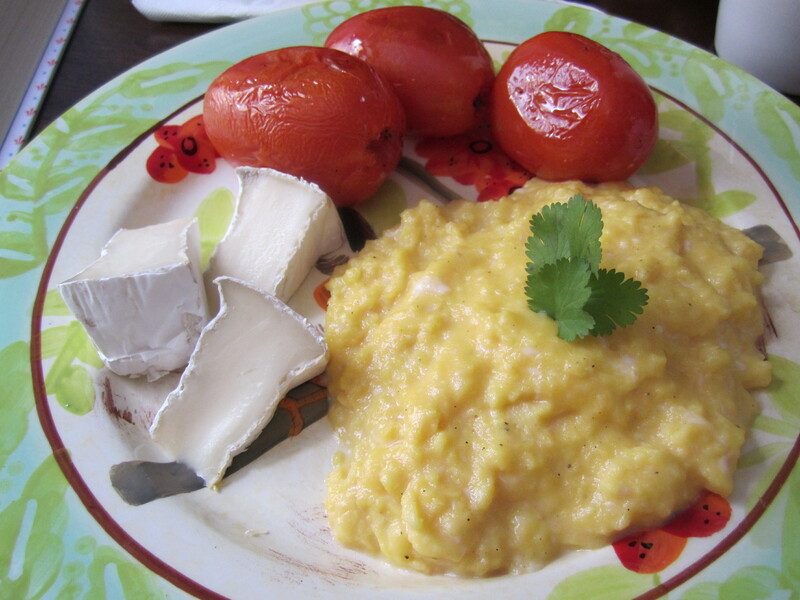 Eventually I settled on scrambled eggs. If this post had a byline, it’d be: Scrambled Eggs, I Don’t Think That Word Means What You Think It Means. If you are anything like me, then you cook your scrambled eggs in a similar fashion to fried eggs only you mix the yolk and egg white together a little before dumping into a pan on moderately high heat and stirring it around for 30 seconds or so until it becomes cooked little egg lumps. Per Julia’s instructions, I cooked my eggs this morning in a sauce pan. A sauce pan! (That’s the pot with the handle, fyi.) The trick is to cook your eggs on low heat in a pan small enough for the egg to be 2/3″ to 1″ deep. Furthermore, when you pour your eggs (lightly beaten with a splash of milk) into the pot there is no satisfying sizzle, and, true to the instructions, nothing happens for the first 2-3 minutes as you seemingly fruitlessly stir. But then, very slowly, the eggs will start to turn into a soft custard, and when it solidifies almost enough to eat with a fork, you remove it from heat and stir in a splash of cream to stop the cooking. The result is breakfast perfection. Now I know why the farmer’s plate at Community (replicated above) always seemed superior to anything I could cook. Well, I reckon it is time to seize the day. This entry was posted on May 1st, 2011 at 1:29 pm and is filed under La Cuisine. You can follow any responses to this entry through the RSS 2.0 feed. You can leave a response, or trackback from your own site. That wall color is gorgeous….do you remember the name of it? PS, totally loving your blog! Hey Meghan, thanks for stopping by :-) Its a Benjamin Moore Affinity shade called “Mysterious”. I used it for my dining nook and have the rest of the living room painted in “Coastline”. I love the way they both turned out. This is how Chef Ramsay says you’re supposed to do scrambled eggs too! I discovered this about a year ago, and haven’t turned back- I now love my eggs this way because they’re so creamy and delicious without any extra fat (although I have found a little grated aged cheddar makes these eggs OUT OF THIS WORLD!) Also, can I get your quiche crust recipe- the ones I’ve tried just don’t turn out crispy or tasty enough?